Have you been wondering who will be racing in Colorado August 18-24th? Now we know. Of course Jens Voigt will be coming, he has announced that the USA Pro Challenge will celebrate his retirement from the sport after decades of racing. Tejay Van Garderen will be back, so too will Lachlan Morton, Matt Cooke, Tom Danielson, and Janier Acevedo - all names you will recognize as past stage or jersey winners at this race. If you watched the 2014 Tour de France you will recognize Rafal Majka (polka-dot jersery winner), Michael Rogers, Leopold König, Alex Howes, and Franck Schleck. Michael Markov and Matthew Lloyd, who both won stages in the Giro d’Italia, will be in Colorado as well. Other crowd favorites include two-time Giro d’Italia winner Ivan Basso. Maple Magnate and big personality Ted King will be back along with well-known American UCI ProTeam riders Peter Stetina, Brent Bookwalter, Phil Gaimon, and Gavin Mannion (a stagiaire with Garmin-Sharp). They will join American UCI Professional Continental riders Danny Summerhill, Jeff Louder, Lucas Euser and Kiel Reijnene. Current American National Champion Eric Marcott will be racing, along with former American National Champions fast Freddy Rodriguez, Ben King and Matthew Busche. The current junior world champion, Slovakian Matej Mohorič, will be racing on team Cannondale Pro Cycling. American UCI Continental riders I look forward to supporting and learning more about include Tom Zirbel, Ben Jacques-Maynes, Danny Eaton, Tanner Putt, Gregory Daniel, Joey Rosskopf, Oscar Clark, Robin Carpenter, Ty Magner, Carson Miller, Ian Crane, Rob Squire, Ian Burnett, Kirk Carlsen, Jacob Rathe, Steve Fisher, Alex Candelario, Bjorn Selander, Carter Jones, Jesse Anthony, Scott Zwizanski, Julian Kyer and Travis McCabe. Drapac Professional Cycling is an entirely Australian team, Rapha Condor JLT an entirely British team, and Optum Presented by Kelly Benefit Strategies an entirely North American team. Hincapie Sportswear Development Team and Team SmartStop will be making a first appearance. 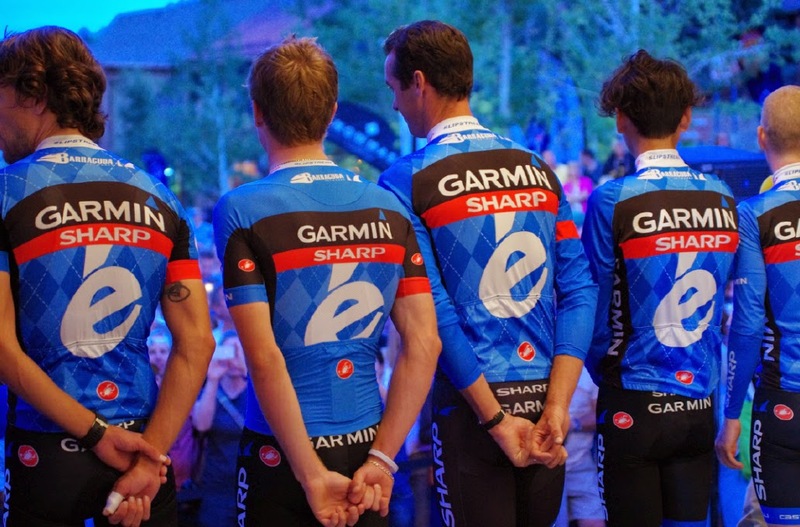 Team Garmin-Sharp in front of the crowd at the Team Presentation in Snowmass Village in 2013. On Saturday, Aug. 16, the teams will be introduced to fans at the opening ceremonies and official team presentation, taking place at Base Village Plaza in Snowmass. Celebrity hosts Phil Liggett and Paul Sherwen will introduce the teams and riders, giving people a chance to check out the best of the best in cycling before the start of the race. The presentation is free and open to the public, with parking available in the lower lots and parking garage at Snowmass Village. You may also take the Gondola from the upper village (more parking and restaurants) to the lower village for free. Related posts by Pedal Dancer: Word of the Day: Stagiaire and Words of the Day: Professional Cycling Teams (Definitions of World Tour, UCI ProTeam, UCI Professional Continental Team, UCI Continental Team).